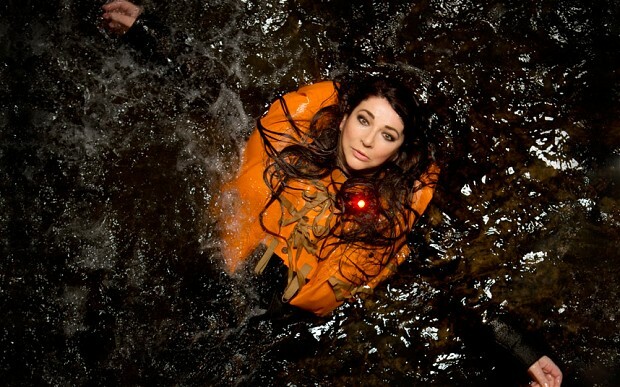 Legendary singer Kate Bush made the Mother of All Comebacks with her live show Before the Dawn in London this month. I was one of the Kate devotees lucky enough to get to see her. I had the strangest dream last night. I dreamed that I saw Kate Bush – the wild-eyed siren whose fever-pitched, baroque music electrified my childhood and provided the soundtrack for my moody adolescence – in concert. In the strange manner in which dream narratives unfold, the Kate of my dreams hadn’t performed in concert since 1979 – roughly the same moment in time that the three year old me was dancing to Wuthering Heights on a kitchen floor in rural New Zealand, “until your nappy fell off”, so my mother tells me. In my dream, Kate was a recluse, abandoning live performance and retreating to the countryside, building a studio at her home where she could work unconstricted by the commercial demands of record labels, where she created her masterpiece, Hounds of Love. As I grew up and become older, Kate appeared to stay ageless, a reclusive white witch figure, emerging every few years with an album of densely layered, lushy orchestrated songs, distinctively Kateian and unlike anyone else, landing on earth with the strangeness and beauty of an alien’s answering machine message. There were long silences between transmissions – twelve years between The Red Shoes and Aerial, and another six before Fifty Words For Snow. In the gaps, other wild-eyed frazzle-haired girls and girly boys followed in her Lilith-sized footsteps: the Bjorks, the Toris, the Polly Jeans, the Goldfrapps, the Anthonys and their Johnsons, all of them blazing a heart-shaped trail of Kate-love, but no one quite capturing the Kateness of Kate. She remained a mystical figure, remote and beautiful, and the promise of her reappearance became a wish unfulfilled, as dreams tend to be. Until my dream last night, that is, when she appeared before me and other members of the Faithful, gathered together in a brightly-lit palace in West London. Onto the stage she danced in bare feet and a flowing tasselled kaftan, her hair in a long Pre-Raphaelite coil, her toenails painted black, like an old hippy covorting in the mud at Glastonbury. She was, as some had feared her to be, not immortal after all, but an actual fiftysomething woman: round faced and broad hipped, with a radiant smile. Or perhaps this was no more than another of shapeshifting personae – the sweet-voiced soccer mom who thanked us for coming – who would lull us into a false sense of security before waking the witch. And so the Kate of my dreams, this almost-human Kate, moved to the front of the stage and belted out some of her best-known hits in ageing rock chick mode, with her backing band behind her. We were at Glastonbury or WOMAD, circa 1999, or a Stevie Nicks tribute concert. Surely at some point an audience member would hold up a cigarette lighter and sway back and forth, while someone lit up a joint and remembered the good old days when love was free, hair was long and apple was just a fruit. As she meandered through Hounds of Love and Running Up That Hill and King of the Mountain, there was passion and energy and an unadulterated joy of performing, but little magic. The ethereal quality of the early albums – mannered and theatrical and vaguely menacing – had evaporated, replaced by a warm and easy energy and a need to connect. We had her in front of us, something none of us had dared to hope for, and yet the reality of her felt strangely unreal. Could this “real” Kate of my dream be as compelling as the dream Kate of my waking hours? And then the dream exploded. We were plunged into darkness, as a man whirled a bullroarer over his head, creating pulsating, hypnotic waves of sound. As the lights returned, we watched an actor calling an unseen coast guard, reporting a woman lost at sea. Silks billowed across the stage to make a rippling green sea, as Kate appeared on video, encased in an orange lifejacket and stranded in the ocean, her hair and make-up strangely pristine, and a warm white light surrounding or possibly emanating from her. We were led into a mini-opera of The Ninth Wave, the B-side of Hounds of Love, a strange and beautiful soundscape of dissonant voices, synthesised beats, Irish bagpipes and ghostly male choirs, staged with a puzzling mixture of hi-tech (helicopters, phallic lighthouses) and the home made aesthetic of the Burning Man festival. There were dancers in skeletonised fish heads, 90s club lighting, lifeguards with chainsaws ripping up the floor, and a ghostly Kate spying on her son and husband as they sat in their living room talking about sausages. Confetti exploded from the ceiling and rained down on the audience, each piece printed with lines from Tennyson’s The Coming of Arthur (“Wave after wave, each mightier than the last / Till last, a ninth one, gathering half the deep”). It didn’t always work. The staging was too on-the-nose in places, and wildly pretentious in others, like an overly workshopped student theatre piece performed under a railway bridge. It felt like the reconstruction of a dream – the scribbled notes or garbled statements we clutch at when we wake up, in the vain hope that we will find in words and images the correlative of our our dream state. She knew enough not to overwhelm the music, which was crisply orchestrated and devastating to hear performed live. Safely rescued from the waves, the dream-Kate sauntered back onto stage with guitar players and accordionists, for a gentle, swaying, all-acoustic and utterly gorgeous sing-a-long to The Morning Fog. And then she was gone. My dream continued as Kate sang the “Sky of Honey” B-side from Aerial. She started seated at the piano as a marionette child waddled about the stage, and her teenage son Bertie daubed at a giant canvas, his Vincent van Gogh hat cocked at a jaunty angle. Behind, a giant backdrop coloured in sunrises out of a Turner painting and giant birds. As church bells pealed and birdsong called, Kate sang along as if to herself. How terribly simple and unremarkable it seemed – a middle aged woman commenting that the sunset was beautiful – but how staggeringly beautiful it was. As we moved into the evening, the dream-Kate broke out the boogie for a rapturous version of Sunset, with the ease and intimacy of an all-night party in her back garden under the stars. As dawn approached, the dream became darker. Kate grew a crow’s wing on one arm, and danced with her guitarist who had sprouted an eagle’s head. The marionette-child knocked on a giant wooden door, panicked by the growing air of menace, and suddenly all hell broke lose: giant tree branches fell into the earth, smashing into the Steinway piano. The dream-Kate laughed maniacally, spreading her wings and flew into the night. Her sky of honey had become a nightmare landscape, and she the head witch, presiding gleefully over the destruction of all she’d created. In the final part of my dream, Kate returned for a sombre rendition of Among Angels, self-accompanied on piano, followed by a triumphant, hands-in-the-air singalong to Cloudbusting. “I wanna hear you,” she cried. We dutifully bellowed “Hey-ee-yay-ee-yay-ee-yay-ee” back to her, our hands outstretched like adoring disciples, slain in the spirit of Kate. And so we rose to her and applauded and cheered until our throats were hoarse. We went home tired and happy that night, grateful and disbelieving that we’d spotted a unicorn in our midst. And then I woke up, not quite believing what I’d remembered or imagined – but feeling happy and full of wonder. What better dreams are there than this?